Garden pots are great for growing many plants and with the right choice they can add style and substance to a garden or courtyard. Used alone they can act as a feature, in groups they can add substance to a paved courtyard. A good design idea is to use pots of different sizes.some can even be lifted up on stands or bricks to add height and variation to the garden. 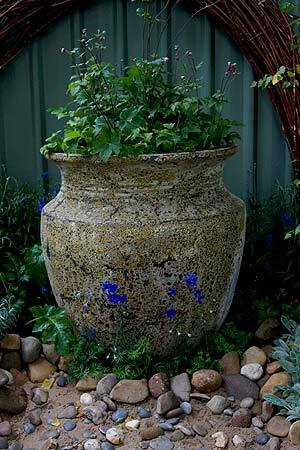 Large rustic garden pots can look great in many of Hobart’s older styles gardens. Many styles of garden pots and planter boxes are available for Hobart, Launceston and Tasmania, both rustic and contemporary designs. We list suppliers of Terra cotta, stone, PVC, steel cast iron and even aluminium the variety of garden pots available is endless. Styles include: Terra cotta Pots, Glazed Pots, Metal Pots, Flowers Pots, Tubs, Urns, Planters, Street Planters, Office Planters, Self Watering Pots and Classical Pots. Growing Native Plants in pots and containers in Tasmania. With our sometimes wet and cold conditions it can be difficult to grow some plants, especially those wonderful native plants from Western Australia in Tasmania. The answer to this may well be to grow them in pots and containers where drainage can be controlled and where plants can be moved to the warmest, sunniest position possible. Selection of potting mix is crucial when growing plants in pots and with Australian Native plants this is even more important. Look for a potting mix that has no water retention crystals added,an open free draining potting mix and a well drained pot can make all the difference.